The man who made trendsetting masala movies. Rajasekhar (not to be confused with Dr Rajasekhar of the Telugu movie world or the Rajasekhar of the Robert-Rajasekhar duo) started his career as a writer with the Ram-Rahim duo. Ram-Rahim, in reality were directors Ramanarayanan and MA Khaja. 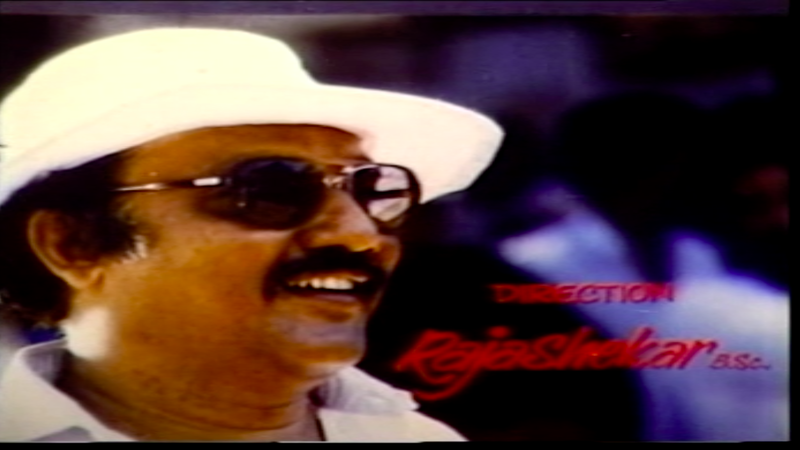 Sivappu Malli was the first movie that was written by Rajasekhar that had a significant impact in the political circles because of its radical left ideologies. He kept writing dialogues for Ram-Rahim duo in movies like Vidukathai Oru Thodarkathai (Gangai Amaren’s first movie as a music director), but his break as a director came in Kannada film world with Hunnimeya Rathriyalli (1980). The movie was a hit and was remade as Punnami Nadu in Telugu by Rama Narayanan. The Hindi version Jeene Ki Arzoo (1981) that had Mithun Chakraborty in the lead was directed by Rajasekhar himself and produced by AVM Productions. AVM gave Rajasekhar gave his first break in Tamil with Amma (1982). Amma was a colossal box-office failure and so was Kanneer Pookal with Vijayan in the lead. It was Malayoor Mambattiyan(1983) that gave him the breakthrough in Tamil cinema. Mambattiyan was based on a real-life Robin Hoodish criminal in the Salem area during the late 50s and early 60s¹. The movie with Thiyagarajan and Saritha in the lead became a box-office hit. This also marked his first collaboration with Ilaiyaraaja that lasted for the next 10 years (except for few movies). With such a hit under his name, Rajasekhar made commercial masala movies for Rajinikanth (Thambikku Endha Ooru, Padikkathavan, Maaveeran, Maapillai and Dharmadurai) and Kamal Hassan (Kaaki Sattai and Vikram). He also made movies with Vijayakanth (Eetti and Cooliekaran) and films like Paati Sollai Thattathe that became a rage in Tamil Nadu because of Manorama’s antics and Super Car (a Volkswagen Beetle that was like Herbie from Love Bug). All these events happened in the span of 11 years from 1980 to 1991 while most of his successful movies were made after 1983. Rajasekhar had the knack of making a perfect masala fare. The right amount of good comedy (remember the Thangachiya Naai Kadichuduchupa comedy of Janakaraj in Padikathavan — this wasn’t there in the Hindi movie), apt casting, placements of songs/action sequences and exact dosage of sentiment needed in the film. Above all, he was also known to have completed movies on schedule, and that’s why producers like Panchu Arunachalam, AVM, Sathya Films and Kalaipuli Thanu roped him to do movies. He also made sure his villain roles were written well. He had a massive role in the rise of Sathyaraj. From being a henchman in Thambikku Endha Ooru, he gave Sathyaraj, a major villain role in Eetti. But in Kaaki Sattai, Sathyaraj even overpowered Kamal in certain scenes. The iconic “Thagadu Thagadu” from Kaaki Chattai and Sathyaraj’s dialogue delivery in Vikram are unforgettable. An excellent commercial director should know how to elevate his characters compared to the hero and Rajasekhar did it correctly in his movies. Sadly, his reign was short-lived as he died in a car accident. It was sad that the accident happened after he attended the 100th-day celebration of Dharmadurai ².
I took some time before making a choice as I had a long list of contenders. Malaiyoor Mambattiyan became his first significant hit, and Paati Sollai Thattathe was a trendsetter and showed the different side of Manorama. I wanted to choose Vikram, the most audacious attempt in Tamil cinema and I wish someone remakes the movie now. Sujatha in one of his interviews has remarked that few portions of Vikram were directed by Santana Bharathi because of date issues ³ and also, Rajasekhar is known for his masala movies, so my choice is Kaaki Sattai. Murali (played by Kamal Hassan) is a son of a retired police constable (played by Kallapatti Singaram). He is obsessed with his aim of becoming a Police officer and trains for the same. Although he doesn’t want to waver from his intentions, due to the affection of Uma (played by Ambika), his neighbour, he falls for her. Although Murali clears his physical fitness exam, he fails the interview and becomes a local thug. He joins a notorious criminal gang headed by Vicky (played by Sathyaraj). Uma believes that Murali has changed and but later he reveals that he is an undercover cop in charge of destroying Vicky and his gang. The rest of the movie is about how he works undercover and finishes the job. Kaaki Sattai is a perfect blend of action sequences, comedy (there was no separate comedian in the movie except for Thavakkalai), songs (all the songs from Ilaiyaraaja were super hits), villainy and romance. The film gave Sathyaraj his permanent place in the list of prominent villains and his “Thagadu Thagadu” is still popular. They even made a song based on the dialogue. It was a casual improvisation by Sathyaraj that was noted by Rajasekhar and Kamal, and they asked Sathyaraj to continue with it. Kaaki Sattai is one of the biggest commercial hits of Kamal Hassan, equivalent to Sakalakala Vallavan. The movie was produced by Sathya Movies (RM Veerappan), and it seems the film crossed 100 days in all the theatres where it was screened in Chennai City ⁴. The movie saw a digital release in 2018. Livingston (actor and director) and GM Kumar have claimed that they wrote the story and screenplay for Kaaki Sattai but they weren’t credited. The problem with the production house like Sathya Movies is that that they credit their story/screenplay to Sathya Movies Kadhai Ilaka (Sathya Movies Story Board) ⁵. It’s sad that they weren’t given credit to such an engaging commercial cinema.